Absolute idealism is an ontologically monistic philosophy "chiefly associated with G. W. F. Hegel and Friedrich Schelling, both German idealist philosophers of the 19th century, Josiah Royce, an American philosopher, and others, but, in its essentials, the product of Hegel." It is Hegel's account of how being is ultimately comprehensible as an all-inclusive whole. Hegel asserted that in order for the thinking subject (human reason or consciousness) to be able to know its object (the world) at all, there must be in some sense an identity of thought and being. Otherwise, the subject would never have access to the object and we would have no certainty about any of our knowledge of the world. To account for the differences between thought and being, however, as well as the richness and diversity of each, the unity of thought and being cannot be expressed as the abstract identity "A=A". Absolute idealism is the attempt to demonstrate this unity using a new "speculative" philosophical method, which requires new concepts and rules of logic. According to Hegel, the absolute ground of being is essentially a dynamic, historical process of necessity that unfolds by itself in the form of increasingly complex forms of being and of consciousness, ultimately giving rise to all the diversity in the world and in the concepts with which we think and make sense of the world. The absolute idealist position was dominant in nineteenth century England and Germany, while exerting significantly less influence in the United States. The absolute idealist position should be distinguished from the subjective idealism of Berkeley, the transcendental idealism of Kant, or the post-Kantian transcendental idealism of Fichte and early Schelling. For Hegel, the interaction of opposites generates in dialectical fashion all concepts we use in order to understand the world. Moreover, this development occurs not only in the individual mind, but also through history. In The Phenomenology of Spirit, for example, Hegel presents a history of human consciousness as a journey through stages of explanations of the world. Each successive explanation created problems and oppositions within itself, leading to tensions which could only be overcome by adopting a view that could accommodate these oppositions in a higher unity. At the base of spirit lies a rational development. This means that the absolute itself is exactly that rational development. The assertion that "All reality is spirit" means that all of reality rationally orders itself and while doing so creates the oppositions we find in it. Even nature is not different from the spirit since it itself is ordered by the determinations given to us by spirit. Nature, as that which is not spirit is so determined by spirit, therefore it follows that nature is not absolutely other, but understood as other and therefore not essentially alien. The aim of Hegel was to show that we do not relate to the world as if it is other from us, but that we continue to find ourselves back into that world. With the realisation that both the mind and the world are ordered according to the same rational principles, our access to the world has been made secure, a security which was lost after Kant proclaimed the 'Ding an sich' to be ultimately inaccessible. Neo-Hegelianism is a school (or schools) of thought associated and inspired by the works of Hegel. It refers mainly to the doctrines of an idealist school of philosophers that were prominent in Great Britain and in the United States between 1870 and 1920. The name is also sometimes applied to cover other philosophies of the period that were Hegelian in inspiration—for instance, those of Benedetto Croce and of Giovanni Gentile. Although Hegel died in 1831, his philosophy lived on. In politics, there was a developing schism, even before his death, between right Hegelians and left Hegelians. In the philosophy of religion, Hegel's influence soon became very powerful in the English-speaking world. The British school, called British idealism and partly Hegelian in inspiration, included Thomas Hill Green, Bernard Bosanquet, F.H. Bradley, William Wallace, and Edward Caird. It was importantly directed towards political philosophy and political and social policy, but also towards metaphysics and logic, as well as aesthetics. America saw the development of a school of Hegelian thought move toward pragmatism. In Germany there was a neo-Hegelianism (Neuhegelianismus) of the early twentieth century, partly developing out of the Neo-Kantians. Richard Kroner wrote one of its leading works, a history of German idealism from a Hegelian point of view. Francis Herbert Bradley (1846–1924), a British absolute idealist who adapted Hegel's Metaphysics. Bernard Bosanquet (1848–1923), a British idealist / speculative philosopher, who had an important influence in political philosophy and public and social policy. Josiah Royce (1855–1916), an American defender of absolute idealism. Benedetto Croce (1866–1952), an Italian philosopher who defended Hegel's account on how we understand history. Croce wrote primarily on topics of Aesthetics, such as artistic inspiration/intuition and personal expression. Giovanni Gentile (1875–1944), important philosopher within the fascist movement. Ghost-wrote "The Doctrine of Fascism"
Alexandre Kojève (1902–1968), gave rise to a new understanding of Hegel in France during the 1930s. His lectures were attended by a small but influential group of intellectuals including Raymond Queneau, Georges Bataille, Maurice Merleau-Ponty, André Breton, Jacques Lacan, Raymond Aron, Roger Caillois, Michel Leiris, Henry Corbin, and Jean Hyppolite. 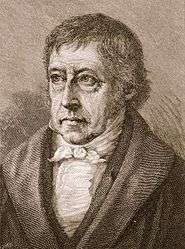 Exponents of analytic philosophy, which has been the dominant form of Anglo-American philosophy for most of the last century, have criticised Hegel's work as hopelessly obscure. Existentialists also criticise Hegel for ultimately choosing an essentialistic whole over the particularity of existence. Epistemologically, one of the main problems plaguing Hegel's system is how these thought determinations have bearing on reality as such. A perennial problem of his metaphysics seems to be the question of how spirit externalises itself and how the concepts it generates can say anything true about nature. At the same time, they will have to, because otherwise Hegel's system concepts would say nothing about something that is not itself a concept and the system would come down to being only an intricate game involving vacuous concepts. Schopenhauer noted that Hegel created his absolute idealism after Kant had discredited all proofs of God's existence. The Absolute is a non-personal substitute for the concept of God. It is the one subject that perceives the universe as one object. Individuals share in parts of this perception. Since the universe exists as an idea in the mind of the Absolute, absolute idealism copies Spinoza's pantheism in which everything is in God or Nature. G.E. Moore took the lead in the rebellion, and I followed, with a sense of emancipation. [Absolutism] argued that everything common sense believes in is mere appearance. We reverted to the opposite extreme, and thought that everything is real that common sense, uninfluenced by philosophy or theology, supposes real. Particularly the works of William James and F.C.S. Schiller, both founding members of pragmatism, made lifelong assaults on Absolute Idealism. James was particularly concerned with the monism that Absolute Idealism engenders, and the consequences this has for the problem of evil, free will, and moral action. Schiller, on the other hand, attacked Absolute Idealism for being too disconnected with our practical lives, and argued that its proponents failed to realize that thought is merely a tool for action rather than for making discoveries about an abstract world that fails to have any impact on us. Absolute idealism has greatly altered the philosophical landscape. Paradoxically, (though, from a Hegelian point of view, maybe not paradoxically at all) this influence is mostly felt in the strong opposition it engendered. Both logical positivism and Analytic philosophy grew out of a rebellion against Hegelianism prevalent in England during the 19th century. Continental phenomenology, existentialism and post-modernism also seek to 'free themselves from Hegel's thought'. Martin Heidegger, one of the leading figures of Continental philosophy in the 20th century, sought to distance himself from Hegel's work. One of Heidegger's philosophical themes was "overcoming metaphysics". ↑ Nectarios G. Limnatis, German Idealism and the Problem of Knowledge: Kant, Fichte, Schelling, and Hegel, Springer, 2008, pp. 138, 166, 177. ↑ "Without exception, the best philosophy departments in the United States are dominated by analytic philosophy, and among the leading philosophers in the United States, all but a tiny handful would be classified as analytic philosophers. Practitioners of types of philosophizing that are not in the analytic tradition—such as phenomenology, classical pragmatism, existentialism, or Marxism—feel it necessary to define their position in relation to analytic philosophy." John Searle (2003) Contemporary Philosophy in the United States in N. Bunnin and E.P. Tsui-James (eds. ), The Blackwell Companion to Philosophy, 2nd ed., (Blackwell, 2003), p. 1.